I will never forget one chilly, overcast afternoon this past December when I was walking through downtown Tegucigalpa. It was just two days before Christmas, and I was running a few errands before heading back to Micah. It seemed as if the whole city were out and about that afternoon, rushing around in a frenzy to purchase last-minute gifts for their friends and family. Usually I walk through the central colonial plaza, but this time I decided to go through the less-transited alleyway that runs adjacent to the plaza. As I rounded the corner, I spotted one lonely figure sitting in the alleyway, tucked away from all the Christmas festivities and busyness of the plaza. 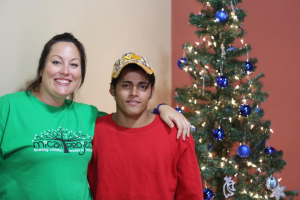 As I got closer, I realized it was Mario – one of the six young men that we have been working with at the old Micah house over these past several months. Mario was sitting on the sidewalk, leaning up against the side of one of the shops that line the alleyway. His shirt and jeans were dirty, and his shoes torn. In one hand he held his bottle of yellow glue, and in the other a small box to beg for money. Seeing Mario sitting there all alone – seemingly forgotten and rejected by the world in a season where family is so important – broke my heart. I will never forget the look of hopelessness and despair on his face as he sat there inhaling the toxic fumes of yellow glue, temporarily numbing the pain of his past and the despair of his present. Yet as soon as Mario recognized me, his face lit up and he got up to embrace me. We talked for a few minutes and I reminded him of the family Christmas celebration we had planned for him and the other five young men the following day at the old Micah house. And although it filled my heart with joy to know that Mario would be able to celebrate Christmas this year, I still could not erase the sadness welling up in my heart as I thought of the injustice and pain in his life. 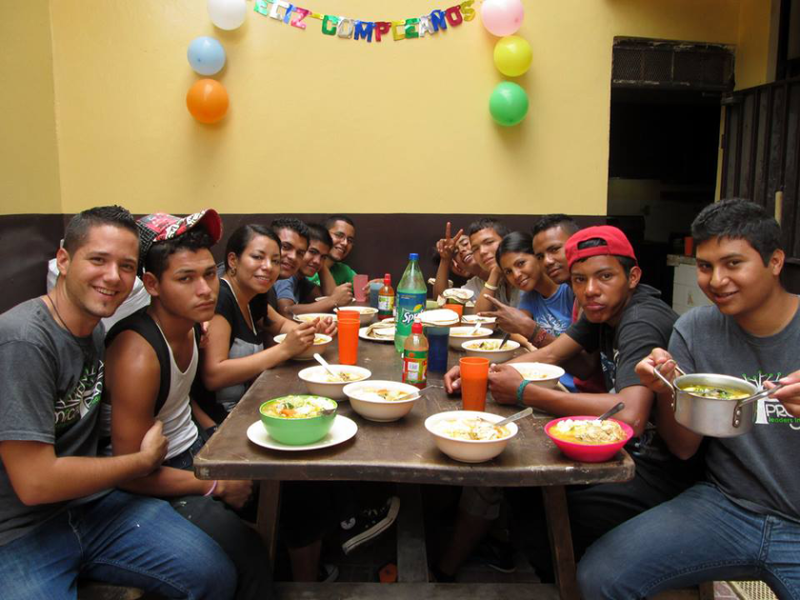 Mario, like most of the youth who have made their “home” on the harsh streets of Tegucigalpa, is the product of a story marked by tragedy and suffering. On top of growing up in a poverty-stricken and gang-infested neighborhood, his childhood was marked by his parents’ unstable and abusive relationship. Then, when he was only 10 years old, his mother passed away from an illness, leaving yet another unforgiving scar on his young heart. Following his mother’s death, everything started falling apart for Mario. Left with a violent and emotionally absent father, he started seeking refuge on the streets of San Pedro Sula. Soon after, he began using various drugs, hoping to forget the pain of his life. He began robbing on a regular basis, and later became involved in gang activity. After running into problems with other gang members and having his life threatened, he fled to Tegucigalpa, where he has remained on and off the streets for the past few years and been addicted to various drugs. In October of last year, however, Mario came to me and expressed his sincere desire to leave the streets in favor of the life that God has in store for him. Through many tears he shared with me that all he has ever wanted in life is to know that someone loves and cares for him. In the months that have followed since that initial conversation with Mario last October, he has faithfully attended the weekly program at the old Micah house along with five other older street teens. In February of this year we launched a new phase of the Isaiah House program, where these young men are now spending two nights a week at the house, and have formal classes, tutoring, discipleship and activities six days out of the week! We are hoping that within a few months the program will be able to begin full time, and these young men will be able to leave the darkness and danger of the streets for good. For now, though, it is a daily battle for each one of these young men who desire to leave the streets behind. It is a daily decision to choose to do the hard work of facing their addictions and their past wounds instead of taking the easy road and remaining lost on the streets. Perhaps one of the most incredible aspects of this program is that – in true Micah fashion – it is so much more than a program; the Lord has been creating a true family bond among us, and that is so healing in and of itself for these young men. Without a doubt, I have come to see each one of these young men as part of my own family, and they too have come to see each other as brothers. At times I am struck by the reality that, for most of them, this is the only family they have in this entire world. And I am reminded, once again, of the urgency to stand in the gap between life and death for them – even when things get really difficult and they want to give up. We have to fight for them. Because perhaps no one else will.